Infinite Enzymes CBH I is an exocellulase (Cel6A: E.C.3.2.1.91) from Hypocrea jecorina. It is produced from a recombinant corn seed production system. It will be provided as an ammonium sulfate precipitate. Activity is determined using methyl-umbelliferyl beta-D cellobioside (MUC). 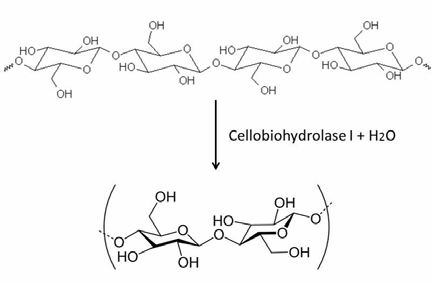 Infinite Enzymes’ Cellobiohydrolase can be used in combination with Endocellulase and β-glucosidase to produce glucose from cellulose. Its activity is dependent on several factors including inhibitors in the substrate (pure cellulose versus plant-derived cellulose), enzyme dose, concentration of other enzymes, feedback inhibition of products, temperature and pH. Optimal temperature for this enzyme is approximately 45° C, although it functions from 37°C through 50°C. pH optimum is 5.0 – 6,0. Infinite Enzymes’ purified cellobiohydrolase (CBH I) is shipped as a liquid slurry of 10 mg/mL enzyme in sodium acetate buffer with 3.2M ammonium sulfate and 0.02% sodium azide. 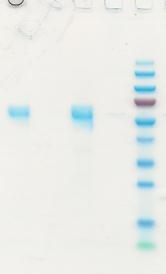 The enzyme is standardized in MUC activity units. The enzyme is produced from recombinant maize that is grown under compliance with USDA regulatory guidelines. 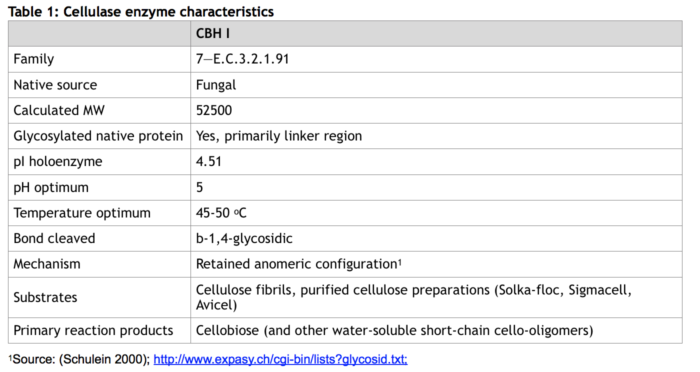 Unlike other commercially available cellulase enzyme, purified CBH I is being produced without typical impurities (other enzymatic side activities) found in fungal-produced enzymes. The enzyme should be stored as a slurry at -20° C.